Skimmers, if you follow the C-Store industry you know it’s been a problem for the past several years that is only growing. Now law enforcement has a new tool in the fight against skimmers thanks to an ambitious computer science professor. 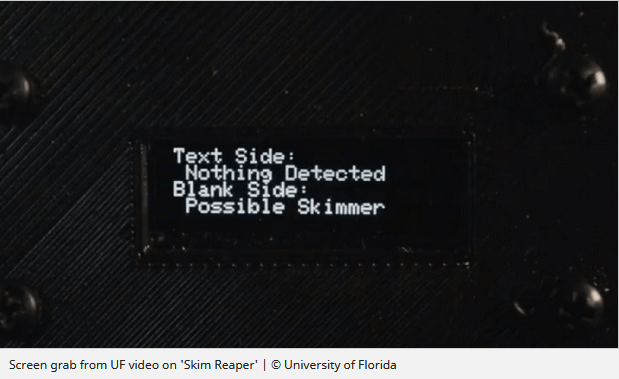 Called the ‘Skim Reaper’, it resembles a long credit card that can be slid into a card slot. It is connected by a wire to a box with a screen that flashes “possible skimmer” when a skimming device is detected. The US$ 50 gadget was invented by Patrick Traynor, a computer information science and engineering professor at University of Florida, and two graduate students. “I’ve been doing skimming for approximately five years now and I have never used anything like this,” said NYPD Detective James Lilla. The U.S. Secret Service estimates that more than a billion dollars is being stolen from consumers every year by skimmers.